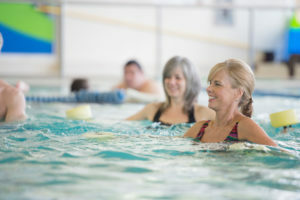 Aquatic therapy is the application of water-based treatment or exercises to promote or improve the physical function associated with illness, injury or disability and is especially beneficial where limited weight bearing is desirable and where normal functioning is limited by inflammation, pain, guarding, muscle spasm and limited range of motion (ROM). Water provides a controllable environment for re-education of weak muscles, restoration of normal movement patterns, unloading of swollen, painful and load-sensitive tissues and relaxation of tight or spastic muscles. Aquatic therapy can be an ideal medium for the treatment of a variety of conditions including acute orthopedic or neuromuscular injury, rheumatological disease, or recovery from recent surgery.